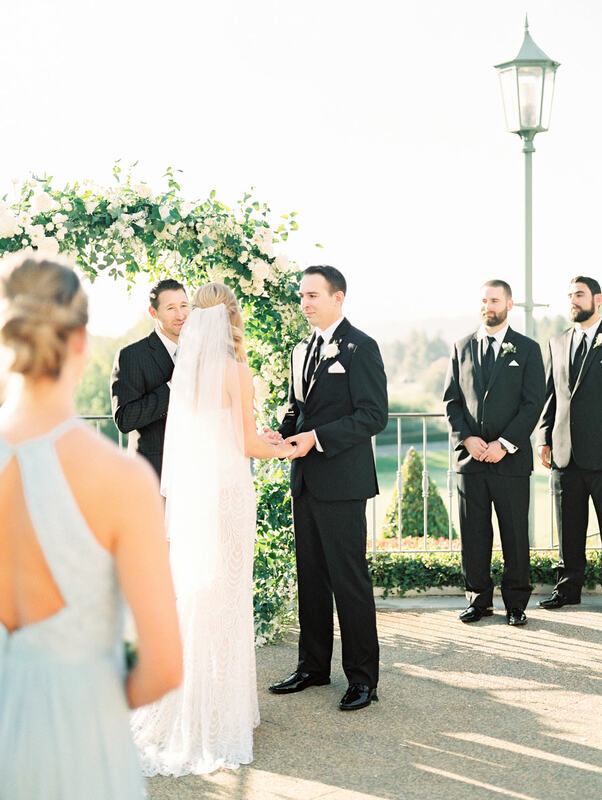 For so long I have been dying to blog images from Taylor and Ian’s Del Mar Country Club wedding. 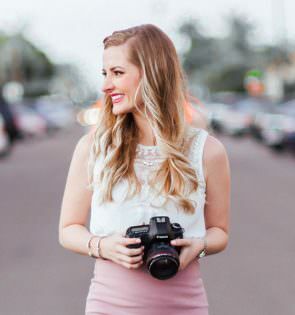 Now that it’s been published on the front page of Style Me Pretty, I can finally share! 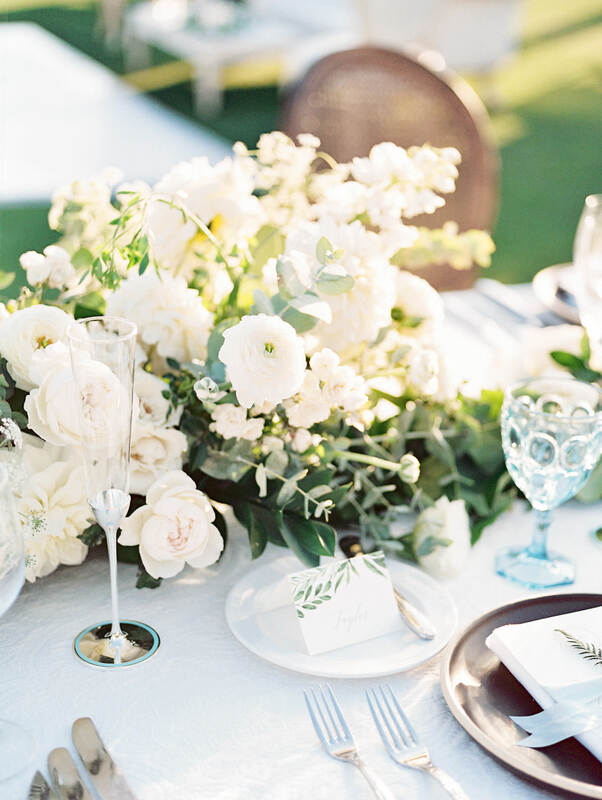 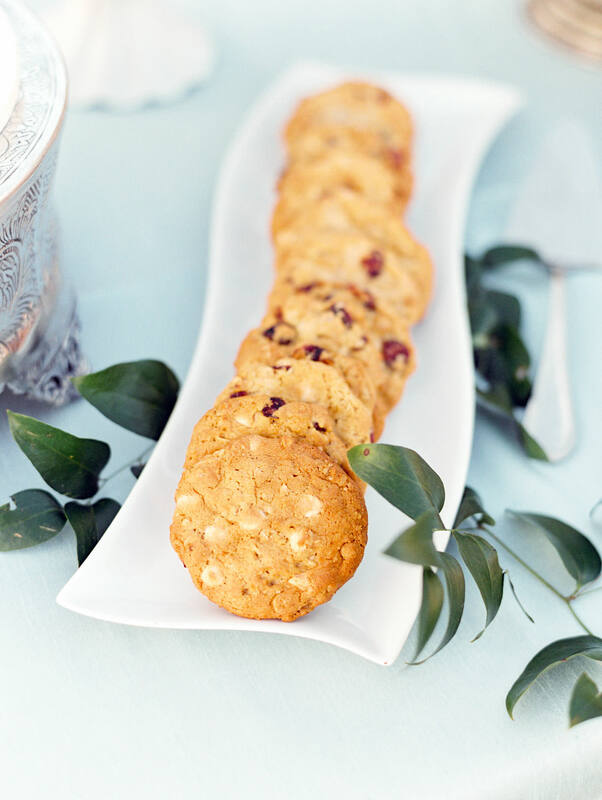 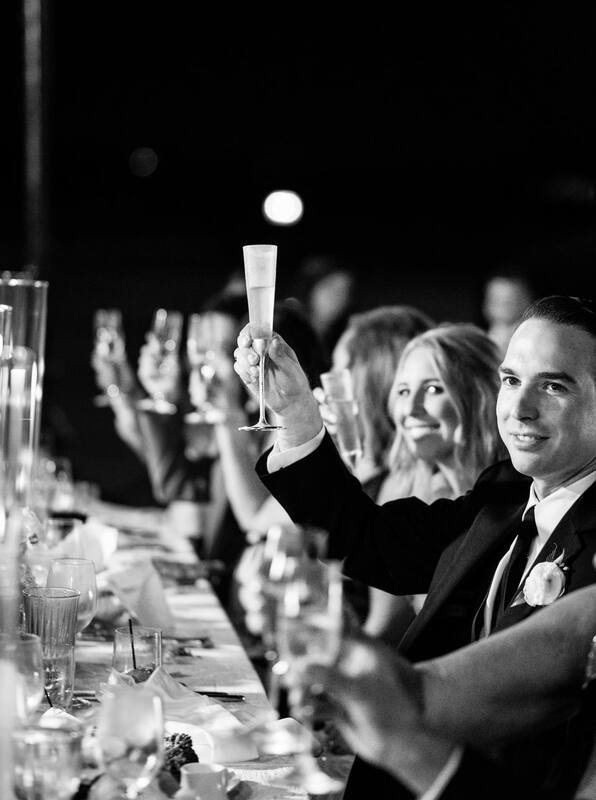 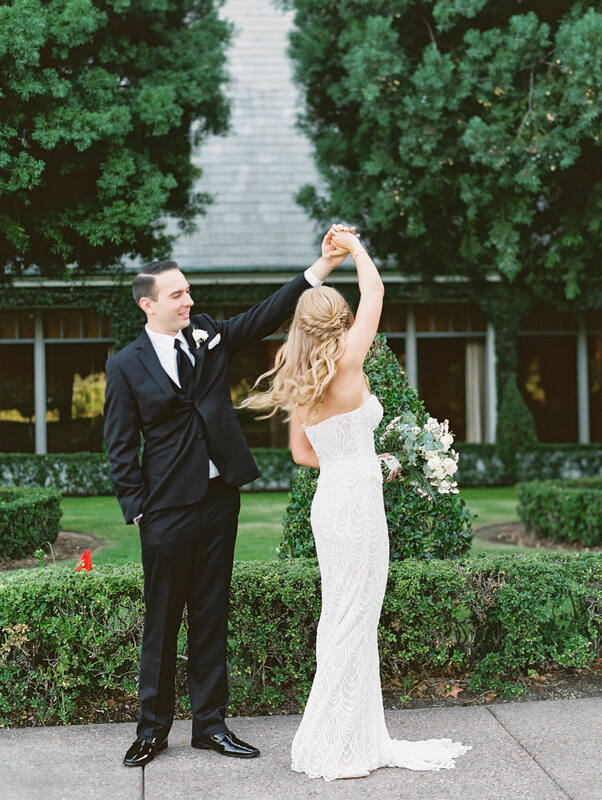 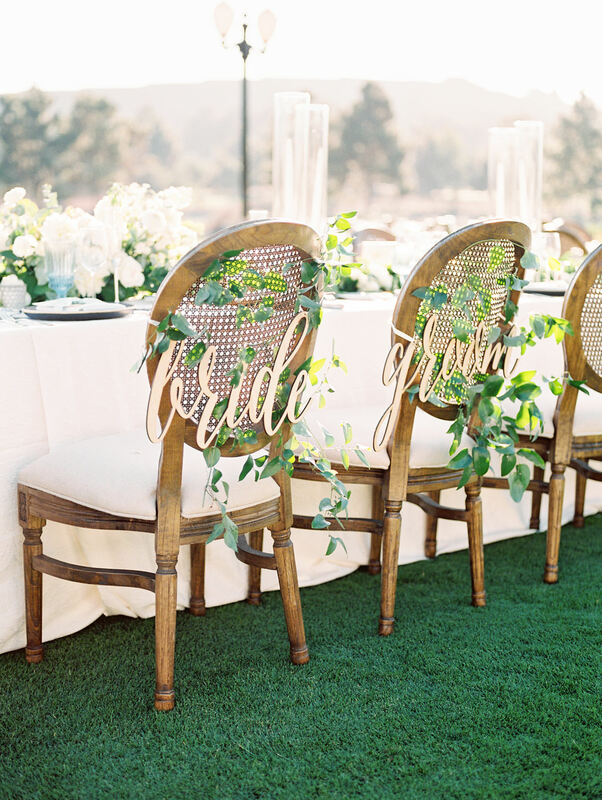 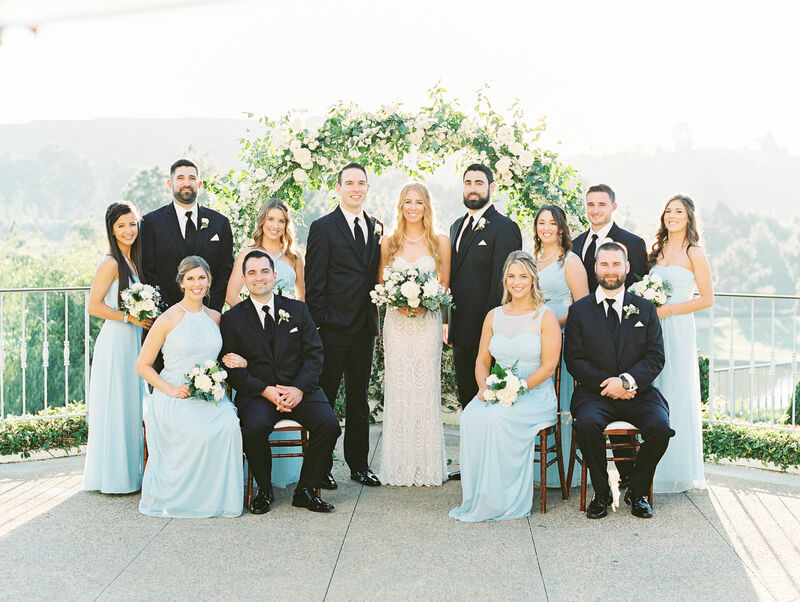 A gorgeous classic al fresco wedding, their celebration deserves to be shared everywhere! 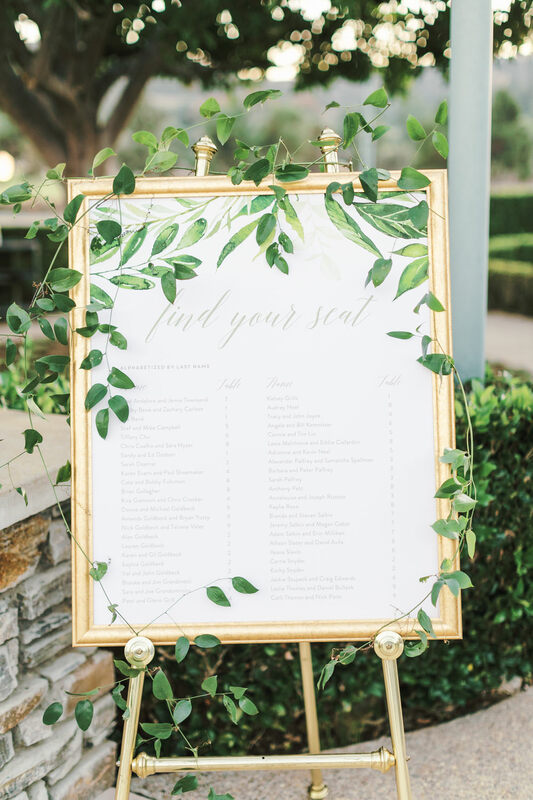 Courtney of Brightly Designed created an elegant invitation suite centered around the letterpress invitation which featured soft, torn edges. 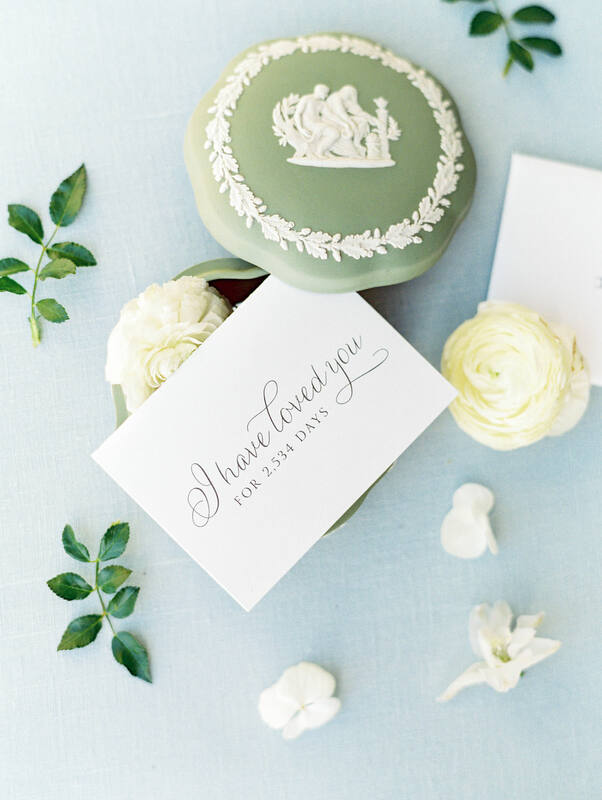 The taupe ink of the letterpress text matched the color of the envelopes. 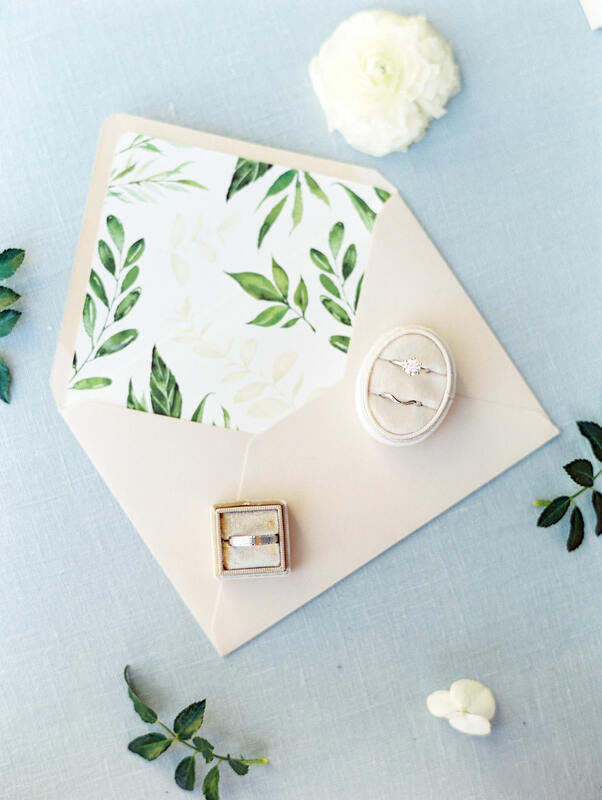 Inside the envelope, guests would find a greenery inspired envelope liner and all of the invitation suite pieces wrapped in light blue silk ribbon. 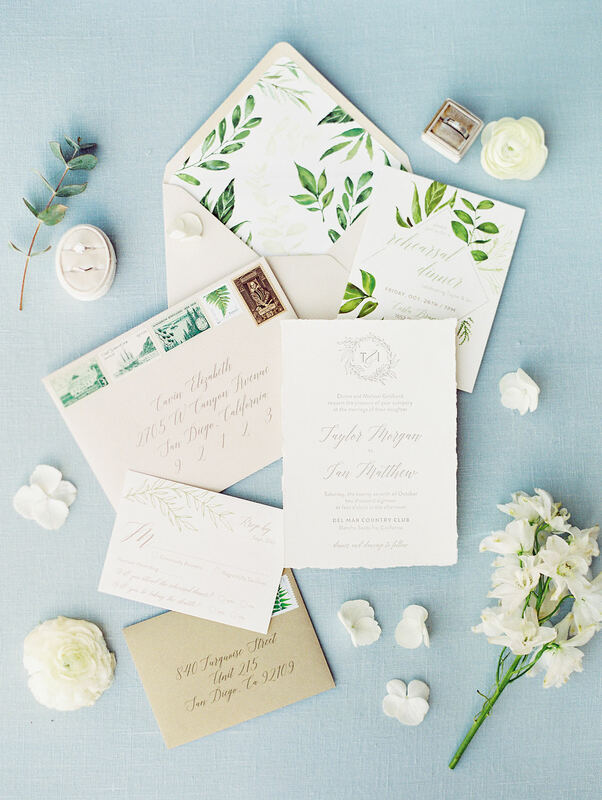 A series of five vintage landscape and nature-inspired stamps were adhered to each envelope. 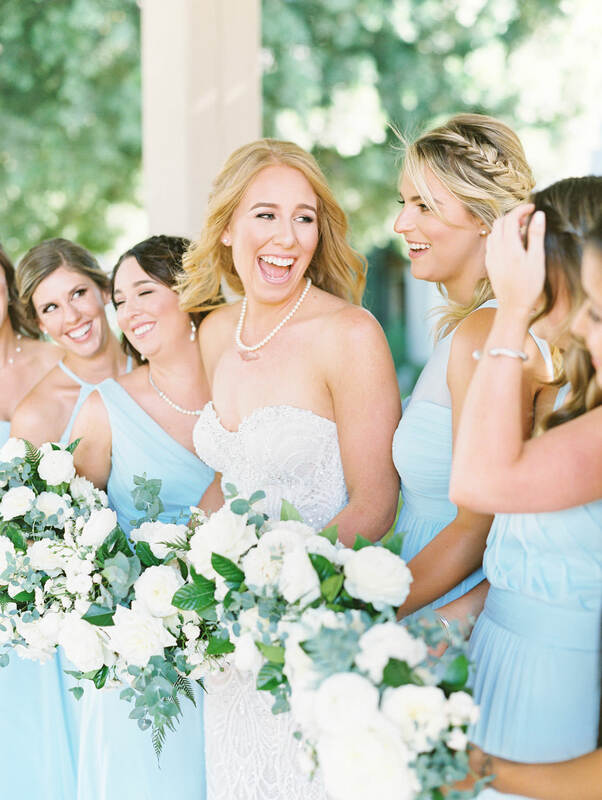 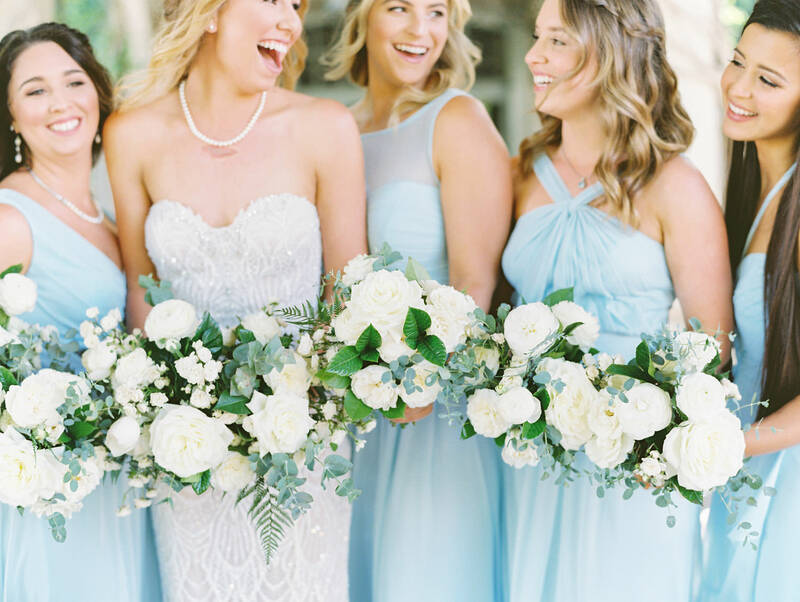 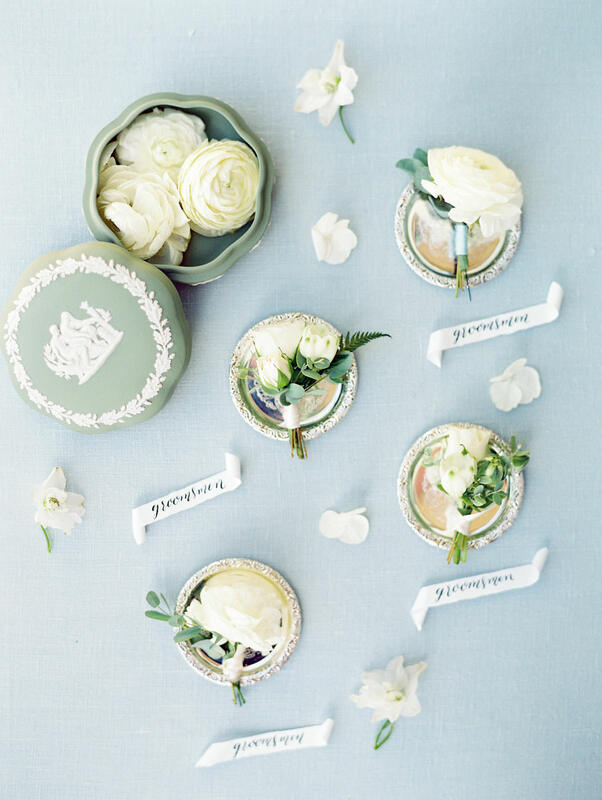 Bridesmaids wore light blue gowns with varying necklines and carried bouquets full of white roses and greenery. 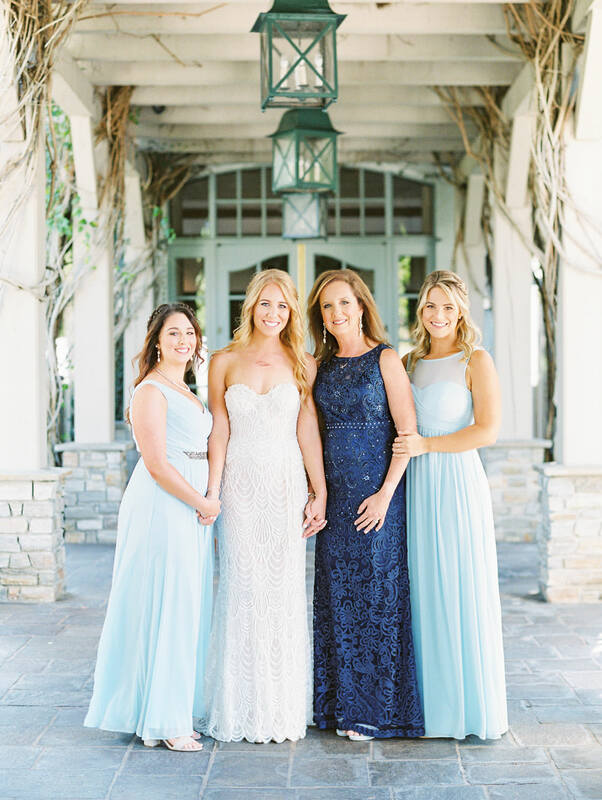 Taylor’s mother donned a deep blue sleeveless gown in keeping with the color tones of the wedding. 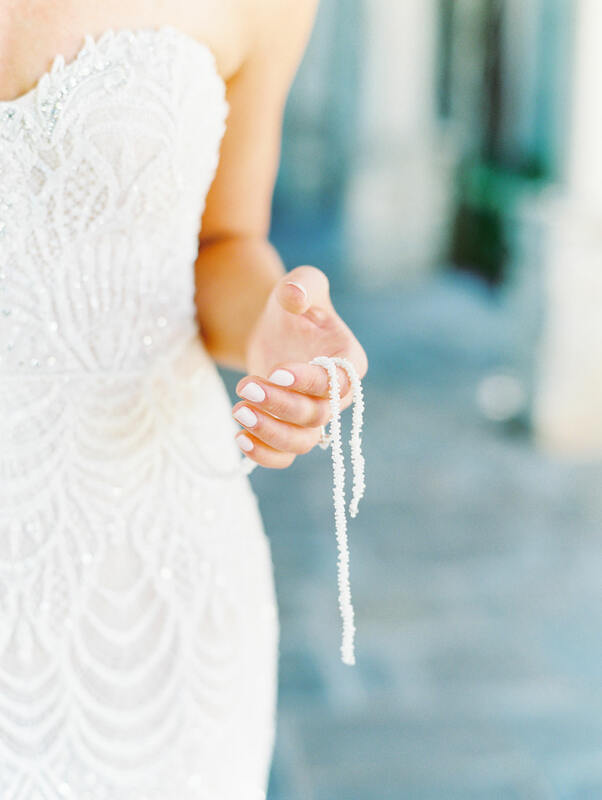 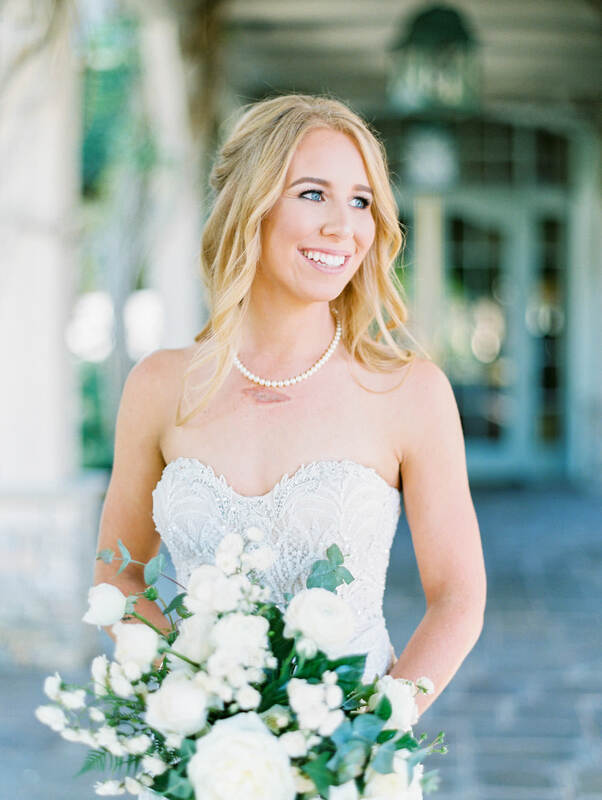 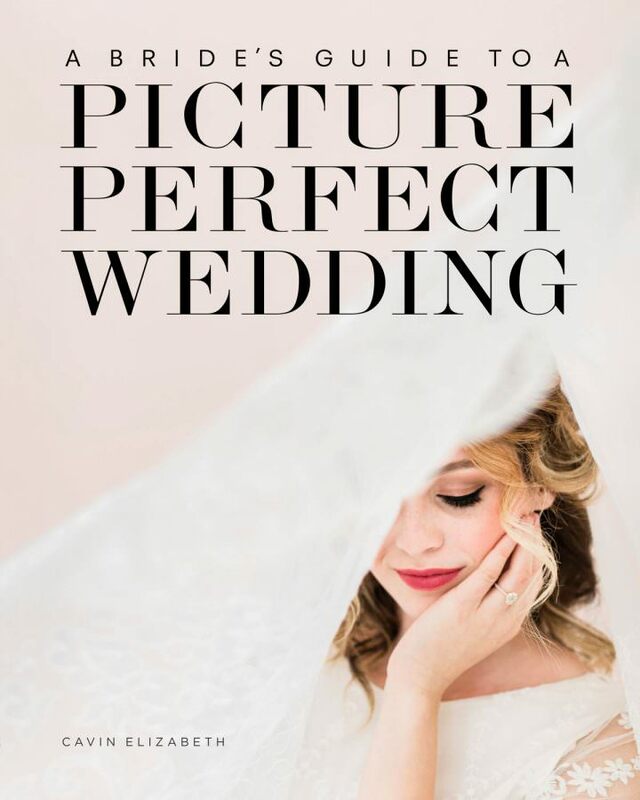 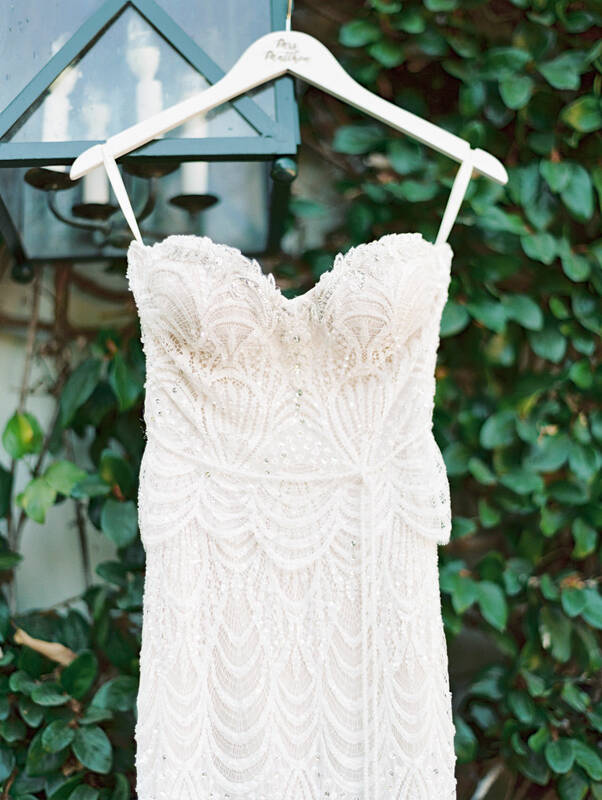 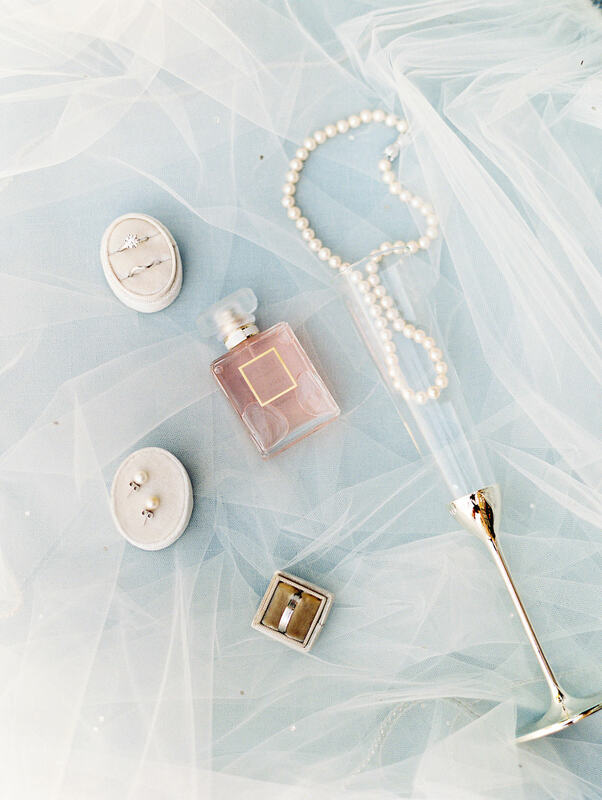 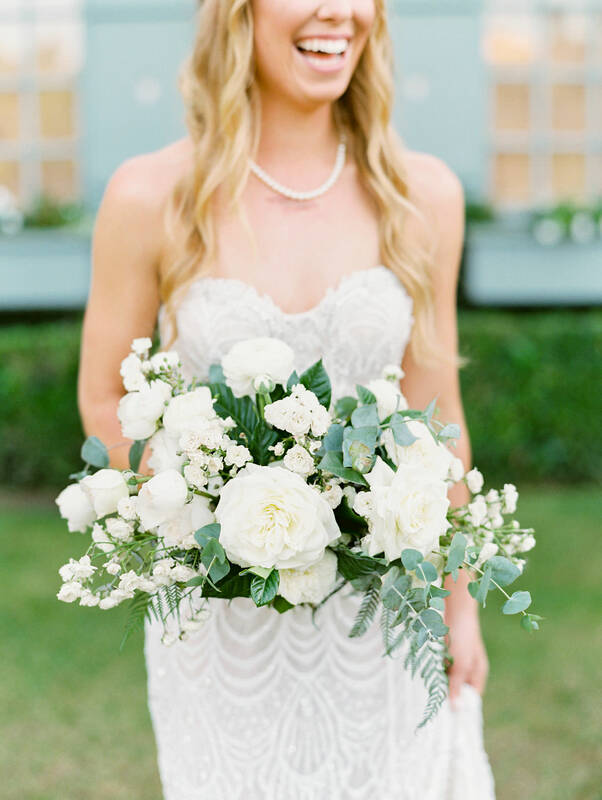 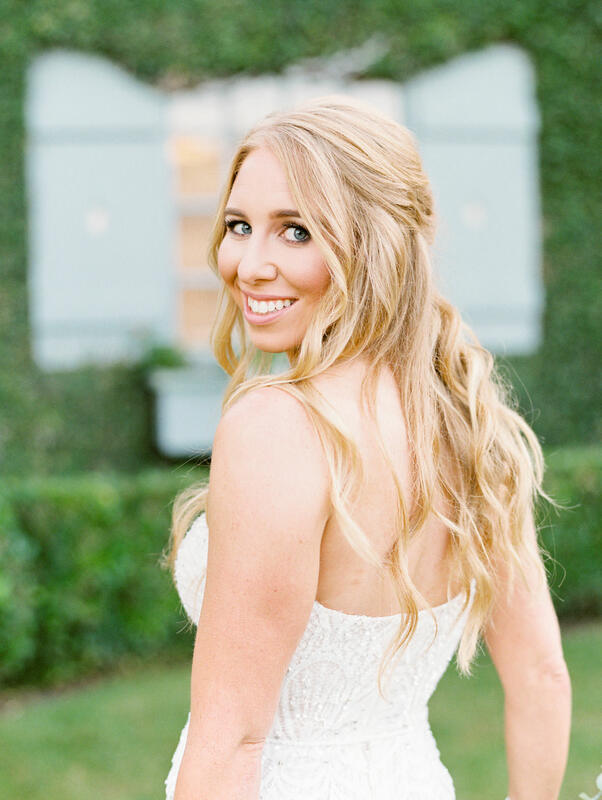 Because Taylor’s Galia Lahav gown featured such intricate beading, she kept her accessories simple with pearl earrings and a pearl necklace that looked beautiful with her long strawberry blonde curls. 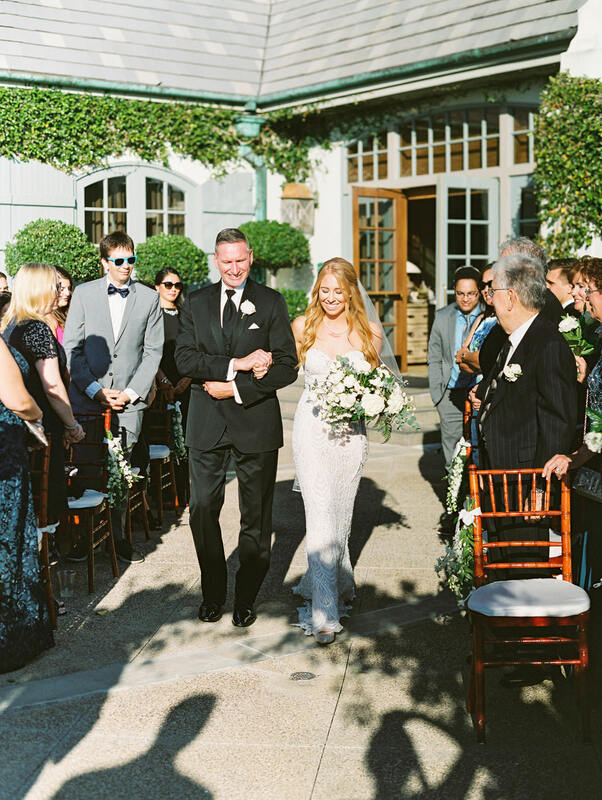 Taylor opted for a first look with her father – a sweet moment from the day! 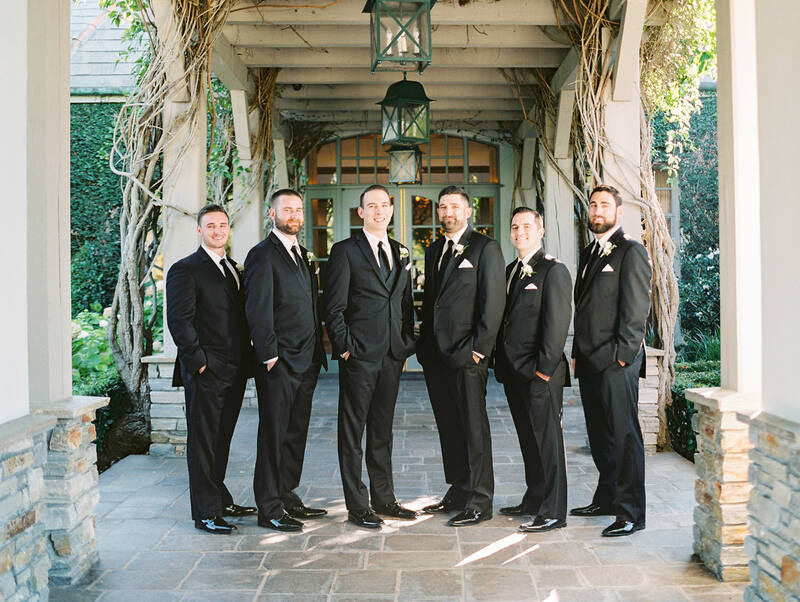 Meanwhile, Ian spent the morning hanging out with his groomsmen. 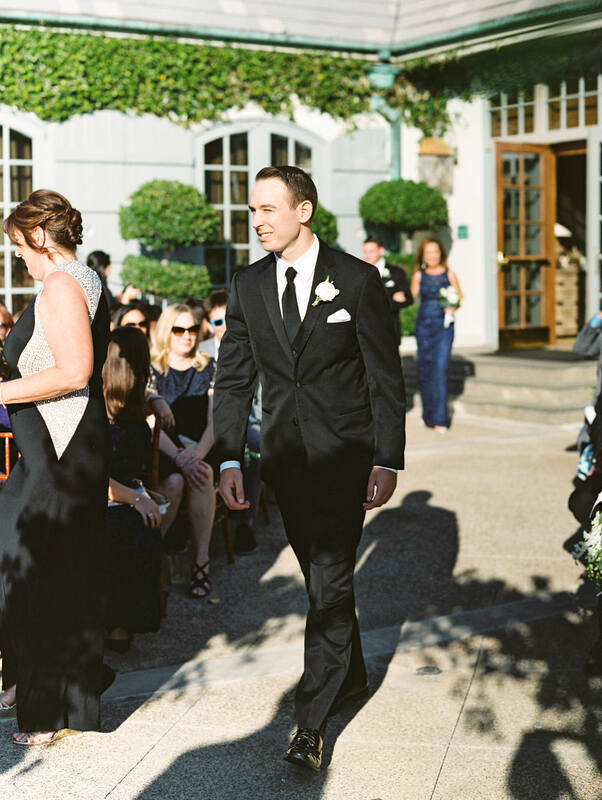 The men dressed in sharp black tuxedos, looking absolutely handsome. 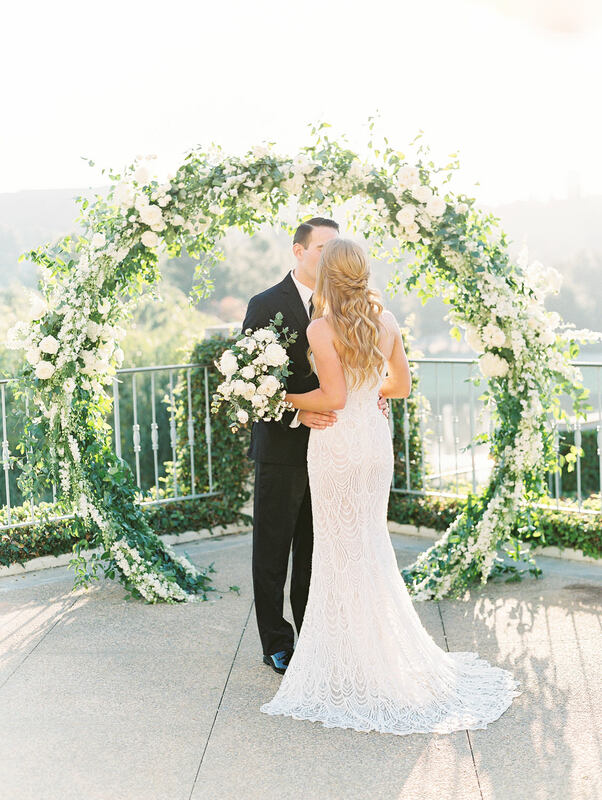 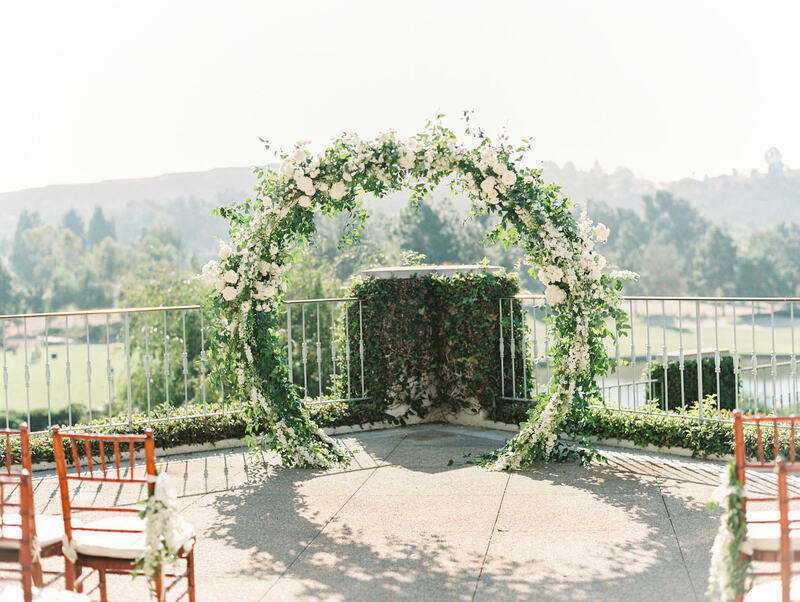 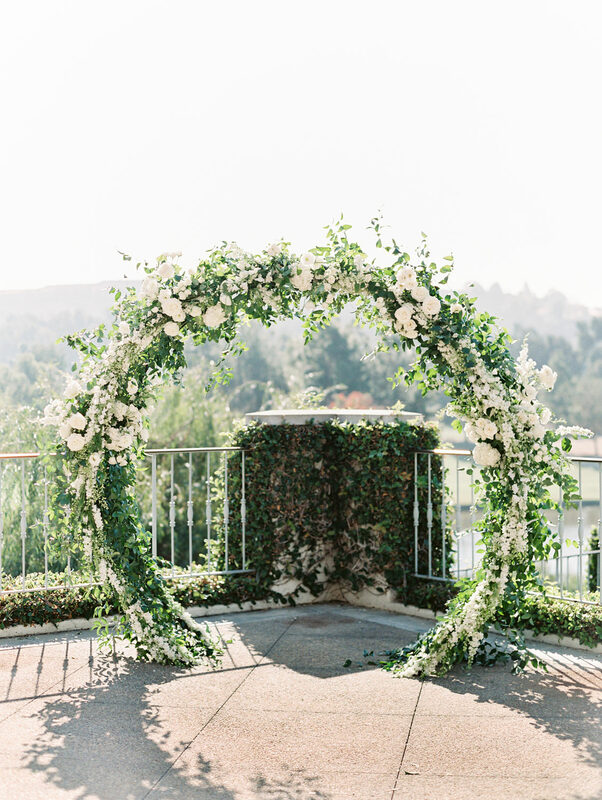 For the ceremony, Taya of Compass Floral made an exquisite circular arch completely covered in various types of white flowers and wild greenery. 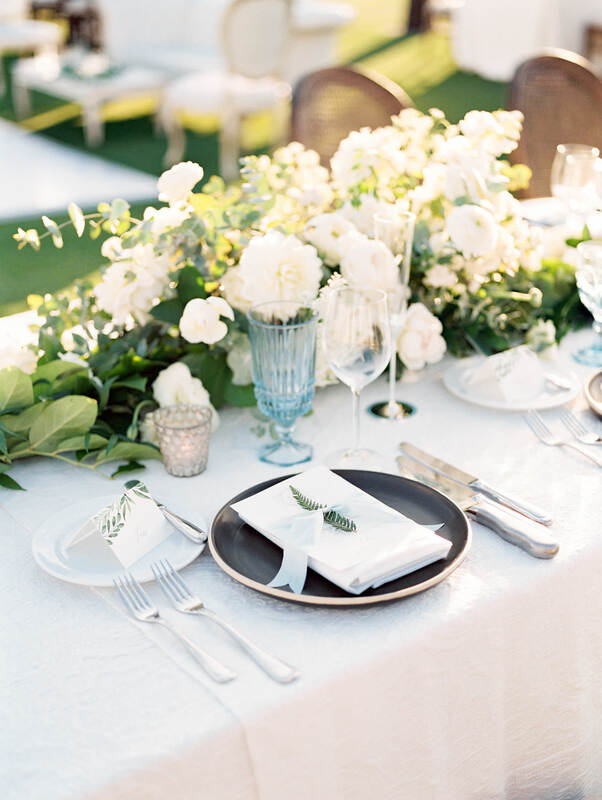 The look was organic and a little wild but also incredibly elegant and refined. 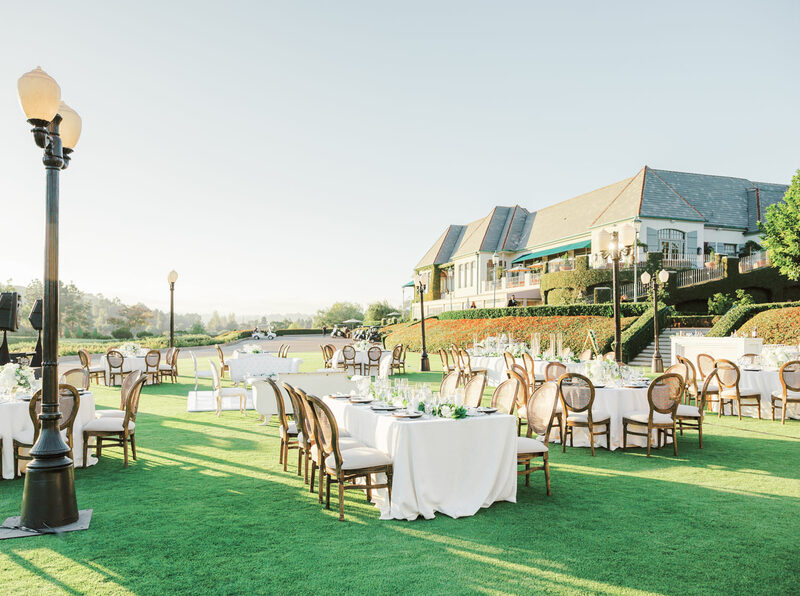 On the aisle, guest seating was adorned with small arrangements of green and white flowers fastened to the wooden Chiavari chairs with white ribbon. 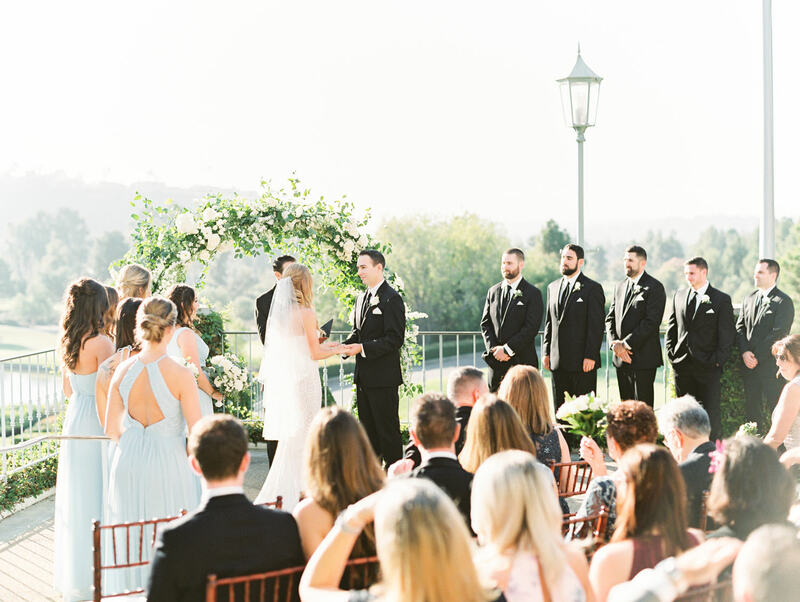 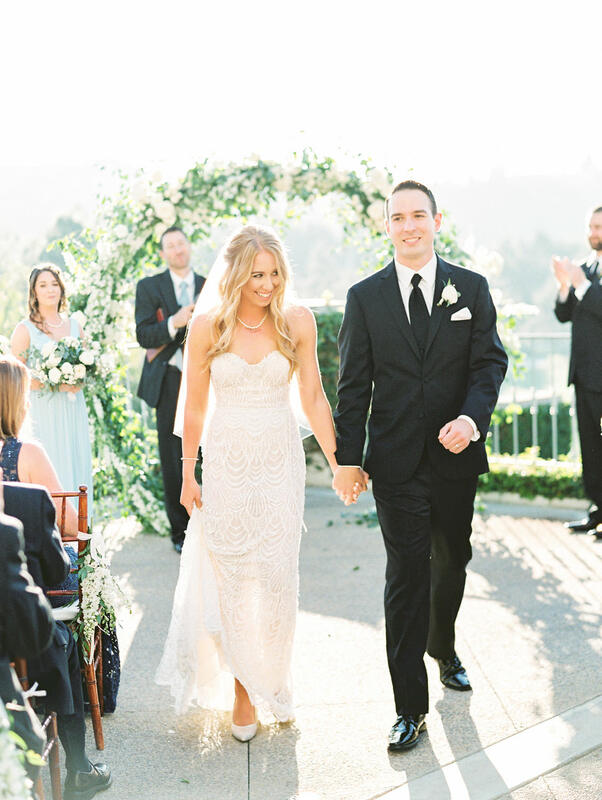 With only around 75 guests, the ceremony took place on an intimate patio and was beautifully backlit by the sun. 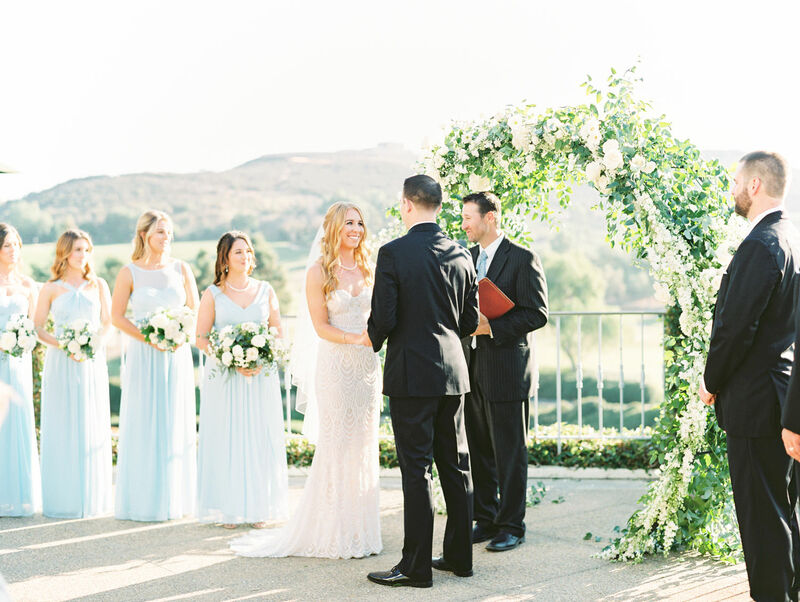 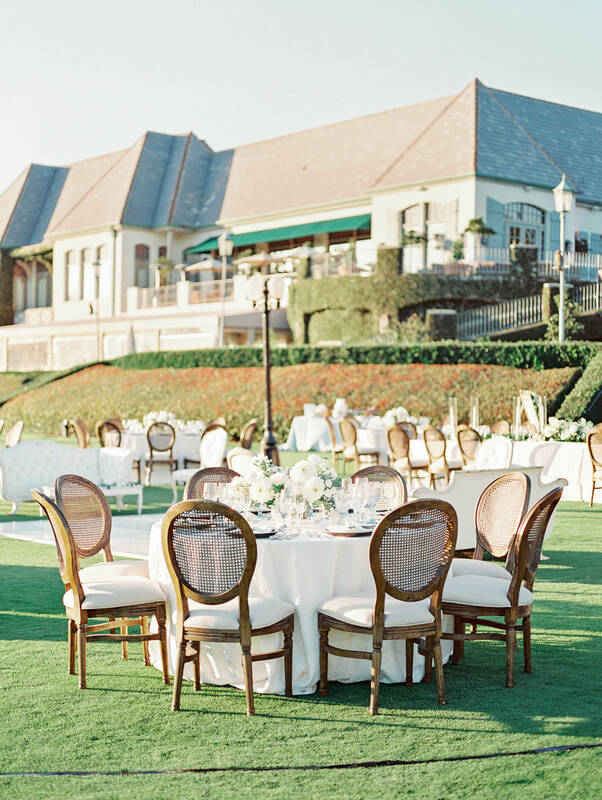 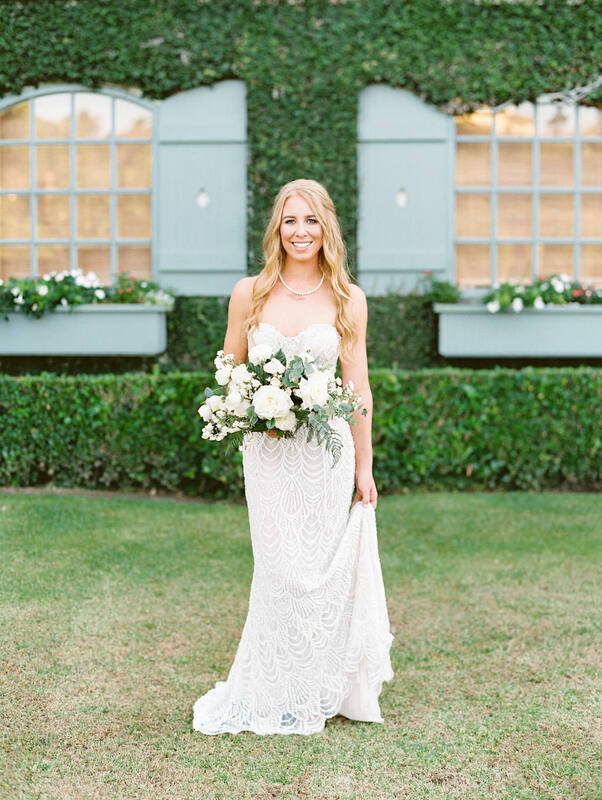 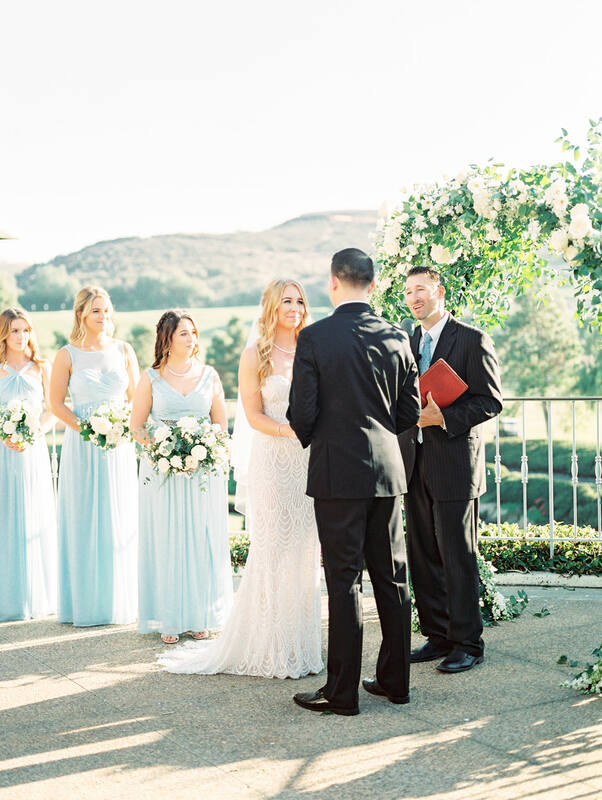 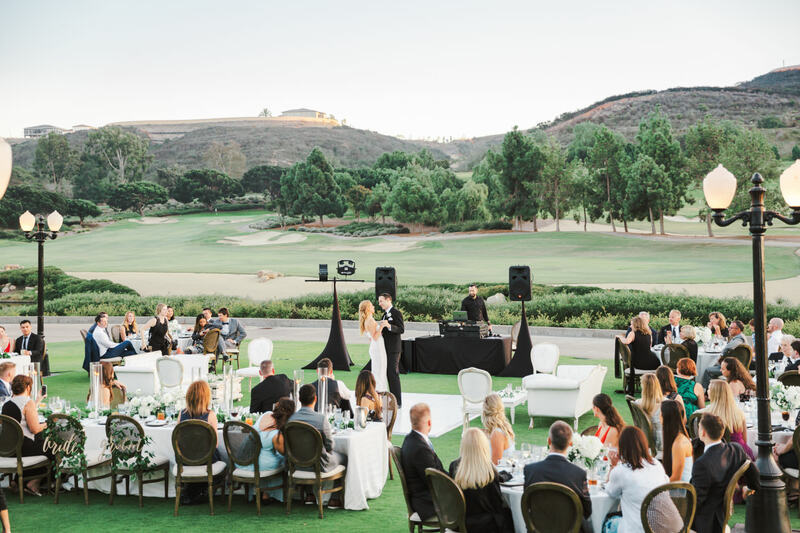 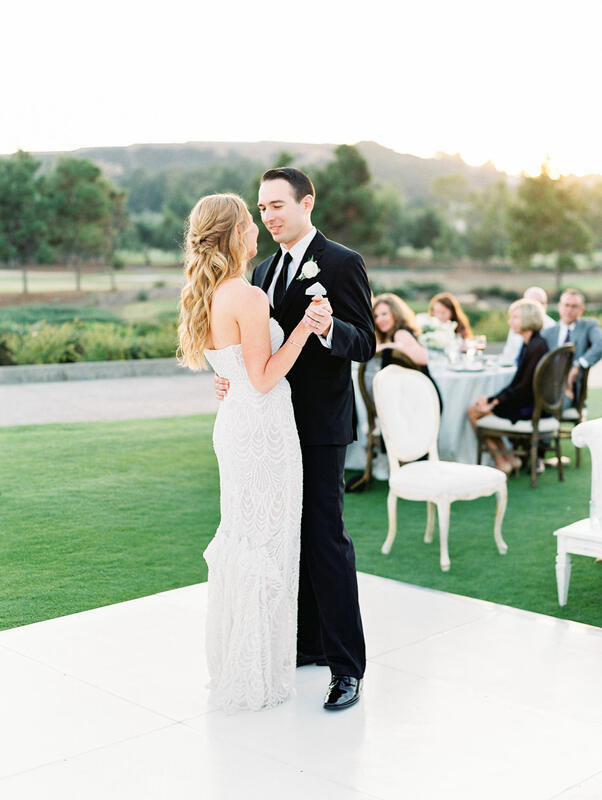 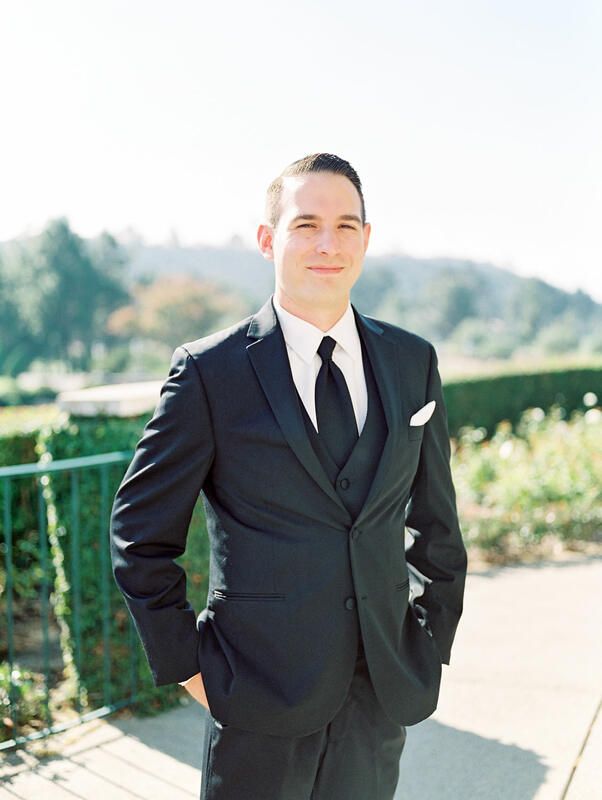 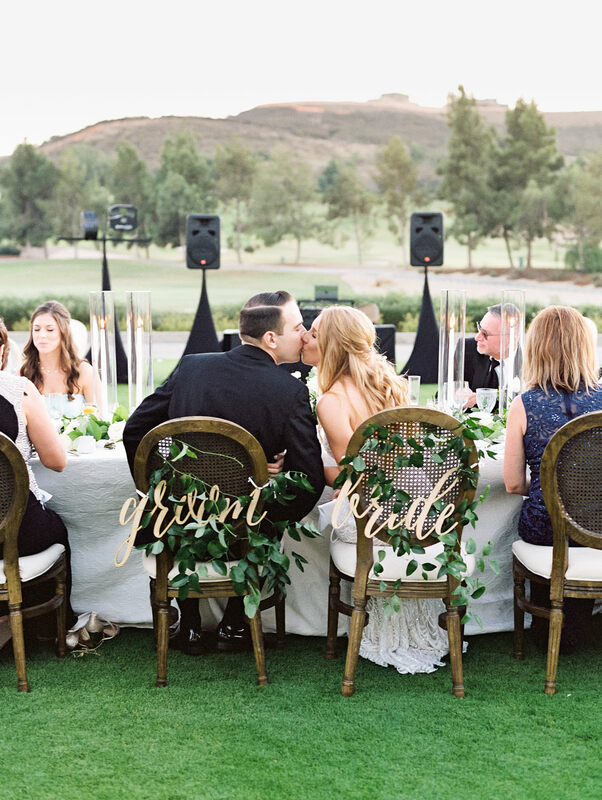 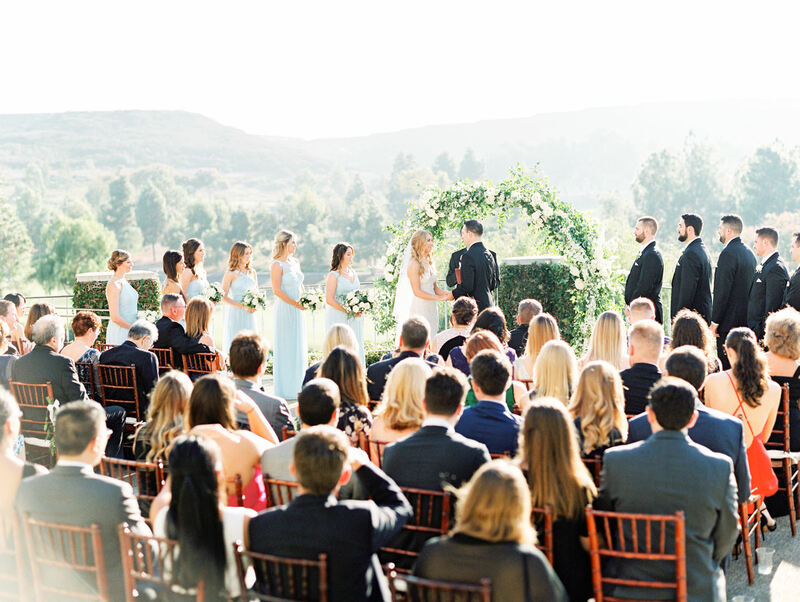 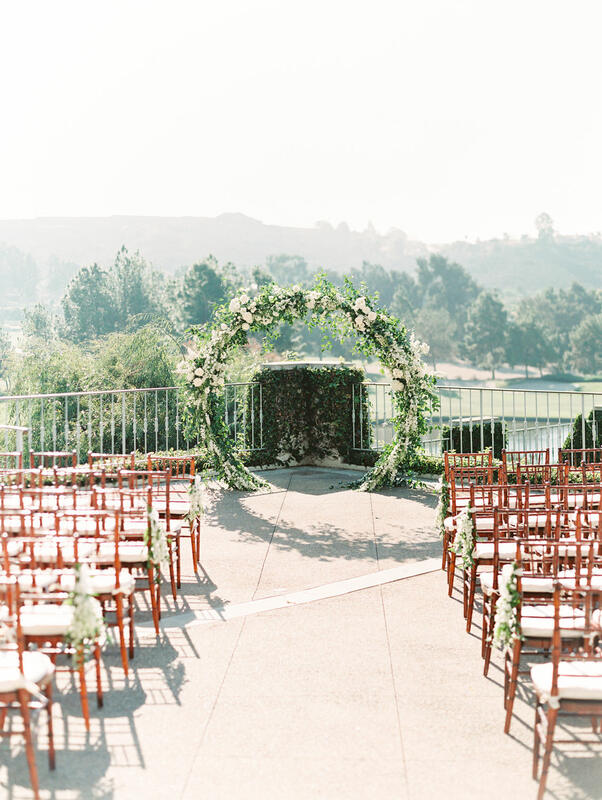 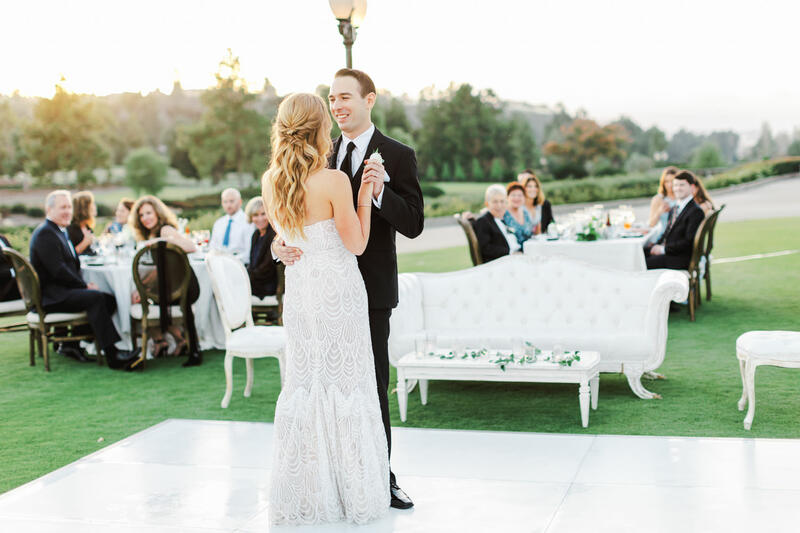 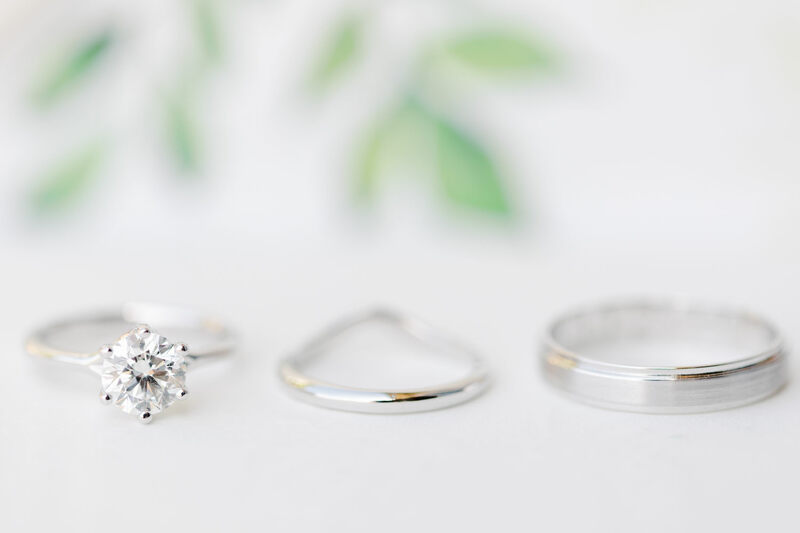 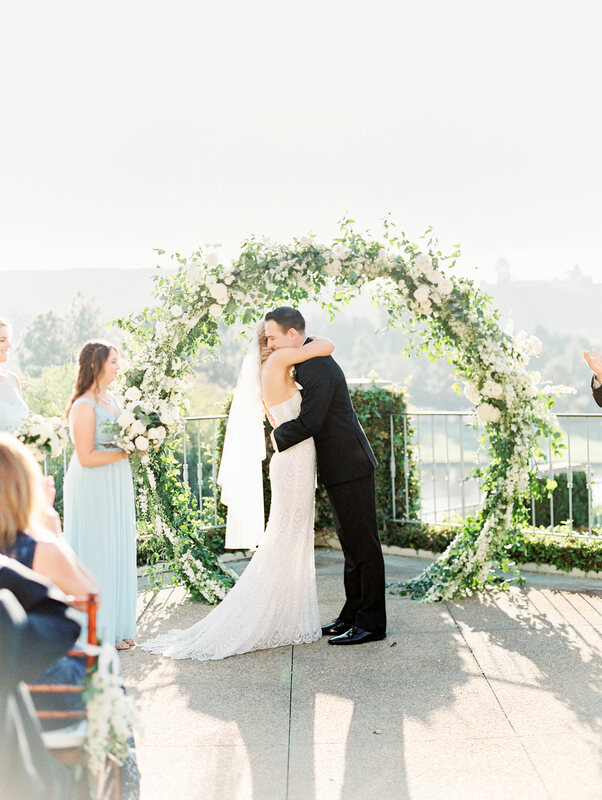 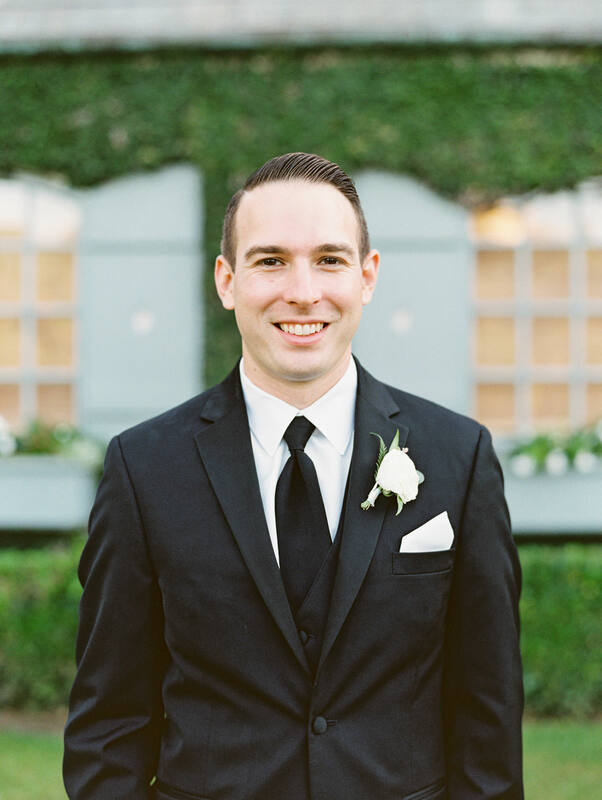 Taylor wanted to make use of a unique spot at the Del Mar Country Club that downplayed the golf course and featured perfect ceremony lighting. 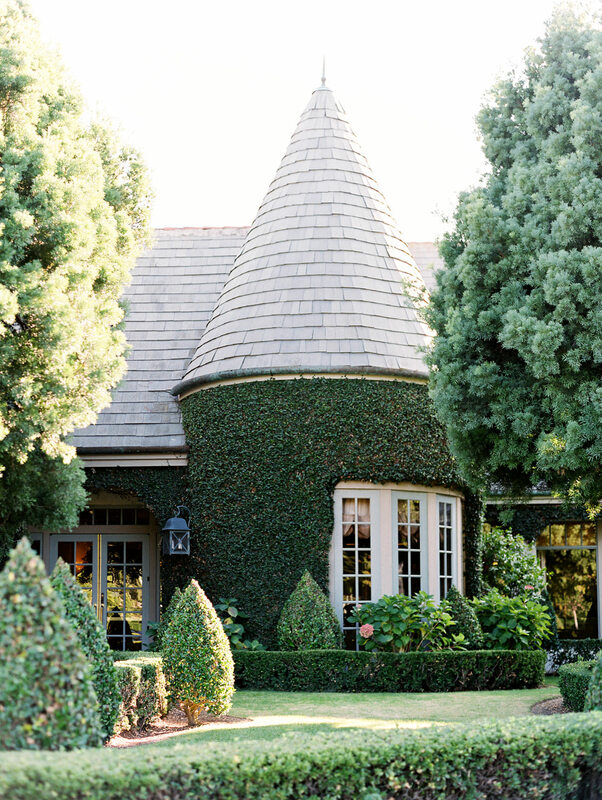 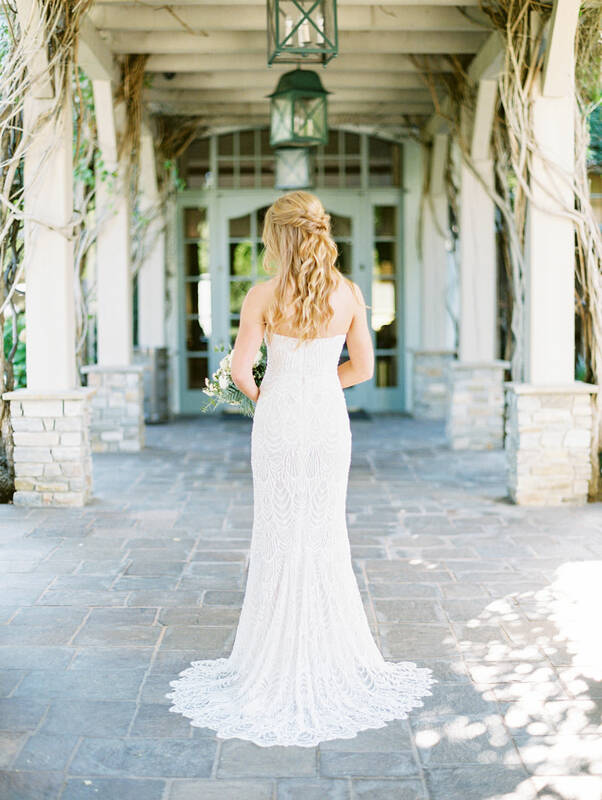 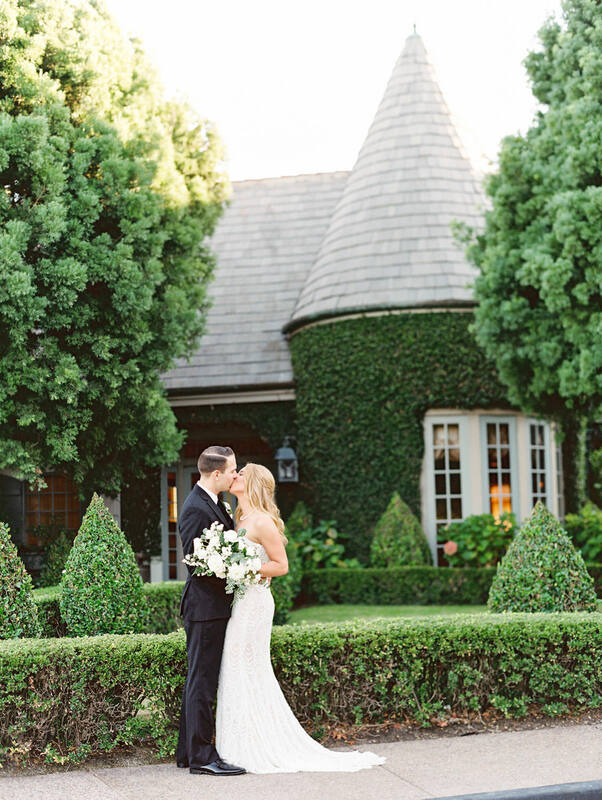 Taylor loves the ivy-covered walls, blue shutters, and grand staircase of the venue. 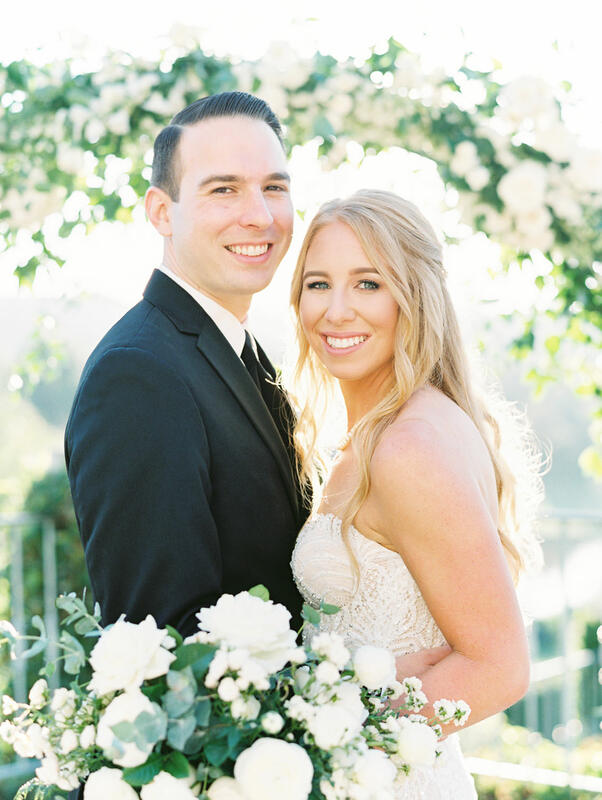 I took their portraits in areas that highlighted these features and they turned out so stunning. 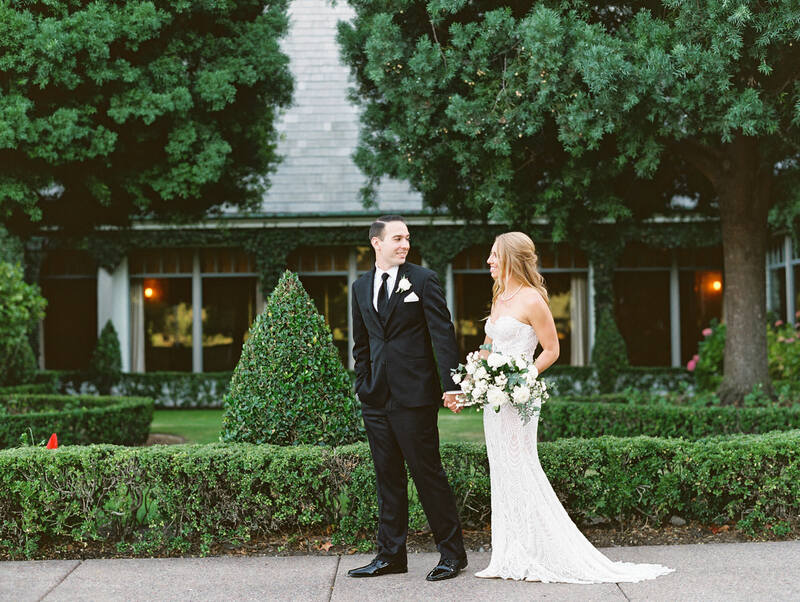 Ian’s black tuxedo and Taylor’s Galia Lahav gown contrasted beautifully with the greenery of the property for an elegant and classic look. 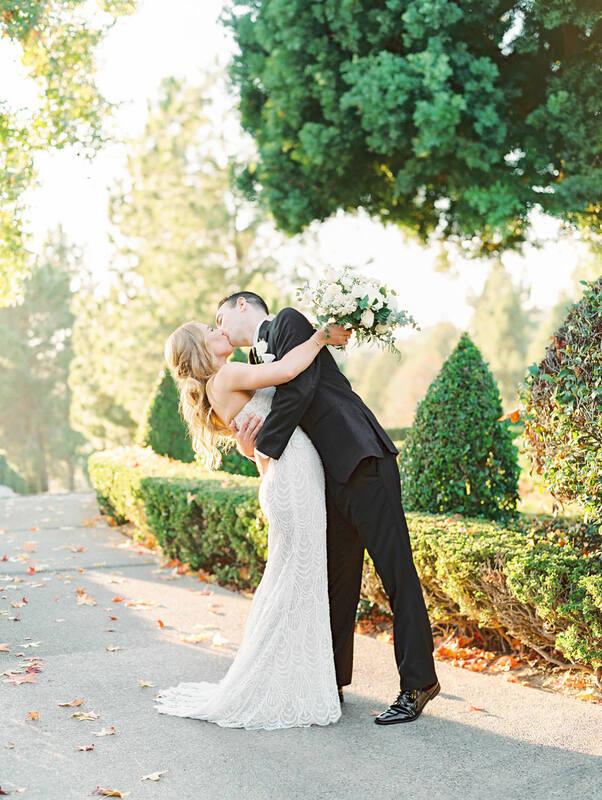 During sunset, I snuck them away for a few more bride and groom portraits. 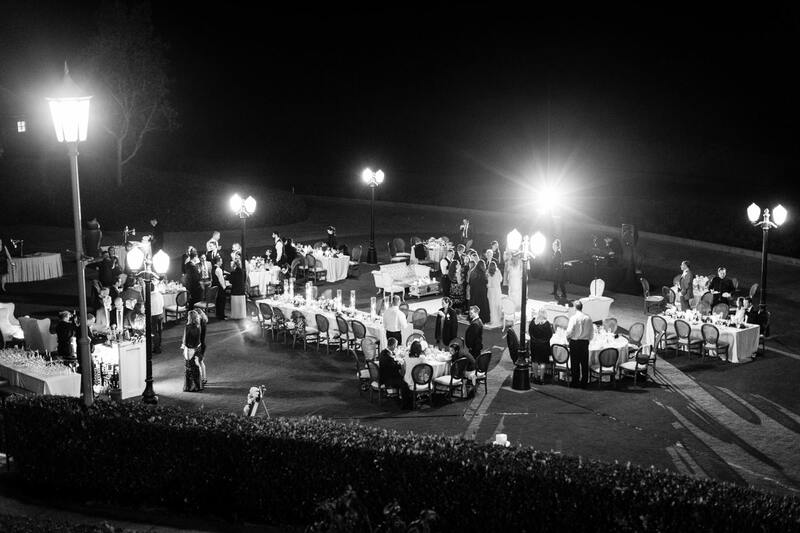 The lighting on south side of the property just glowed! 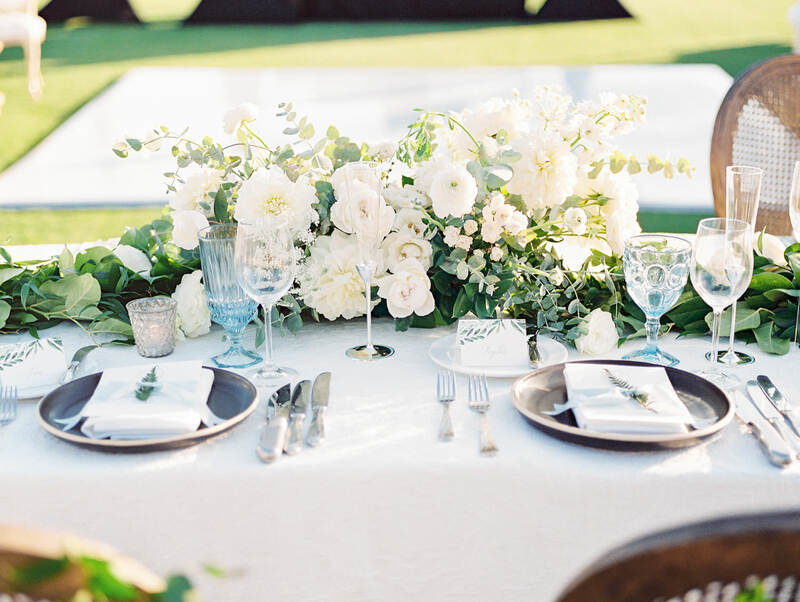 Cara of Luxe Events incorporated the beautiful white and green flowers from Compass Floral with blue glassware and black dinnerware from Hostess Haven to tie in all of the wedding colors. 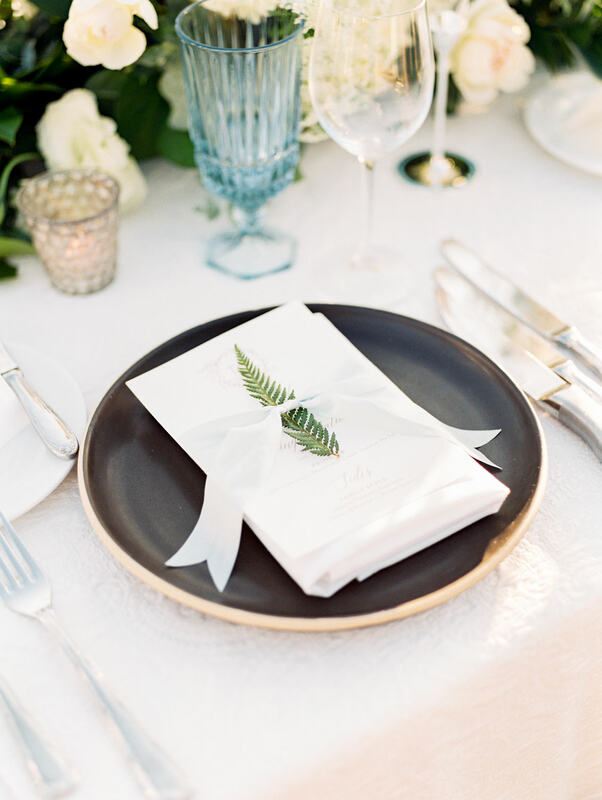 Place cards matching the envelope liner of the invitations rested near the menus that sat beneath ribbon and a sprig of greenery. 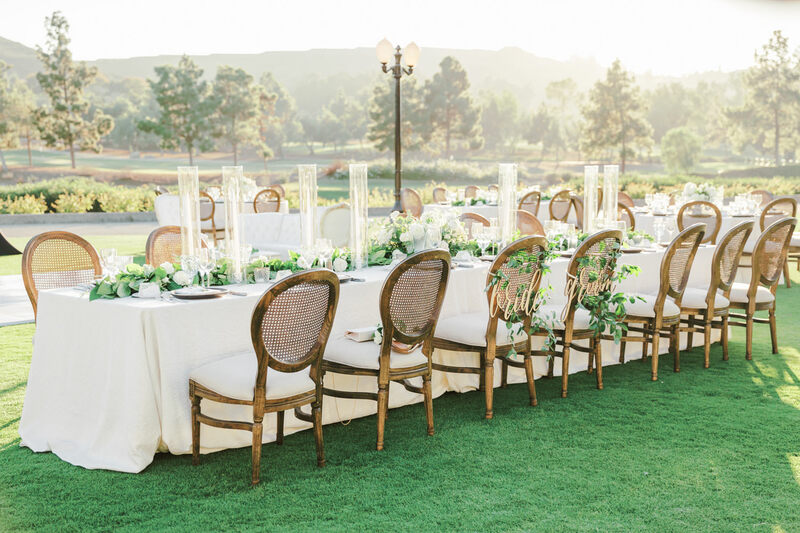 Elegant and vintage cane-back Oak Louis chairs complemented the white textured linens of each table. 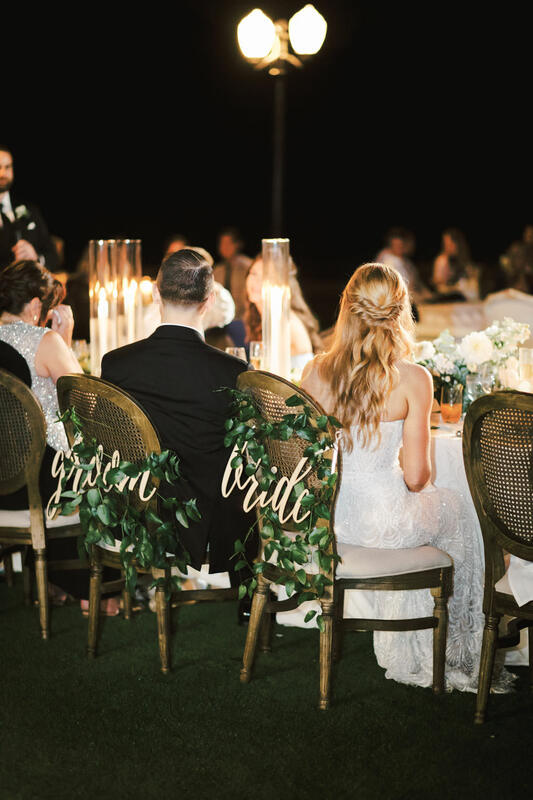 For the bride and groom, wooden laser-cut “bride” and “groom” signs with smilax rested on their chairs. 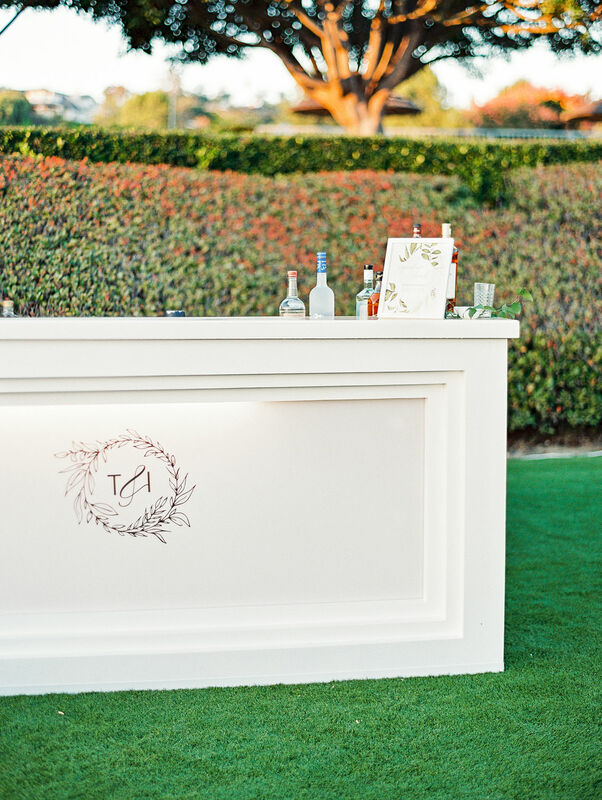 A custom-made white bar with the couple’s wedding logo served the Taylor and Ian’s signature drink, an Old Fashioned. 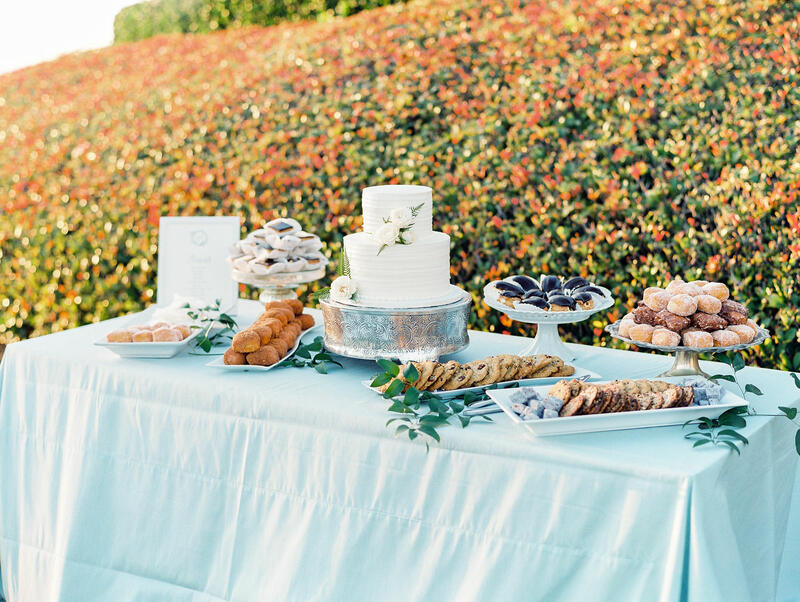 Cara styled the dessert table with light blue linen and several desserts, including donuts and cookies. 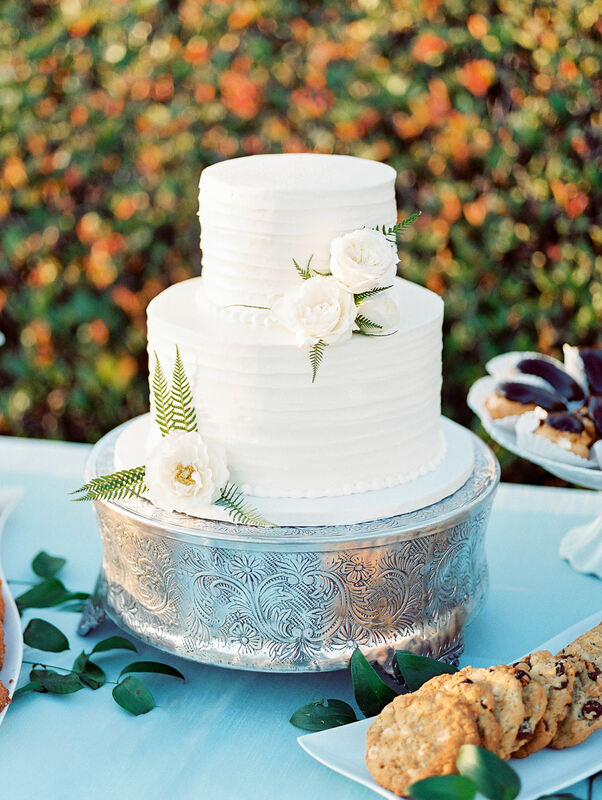 The classic ivory cake featured two sets of floral adornments. 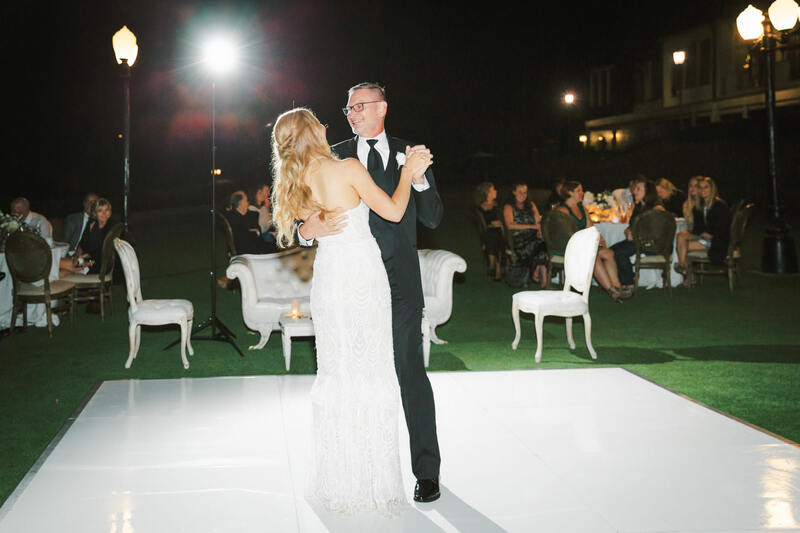 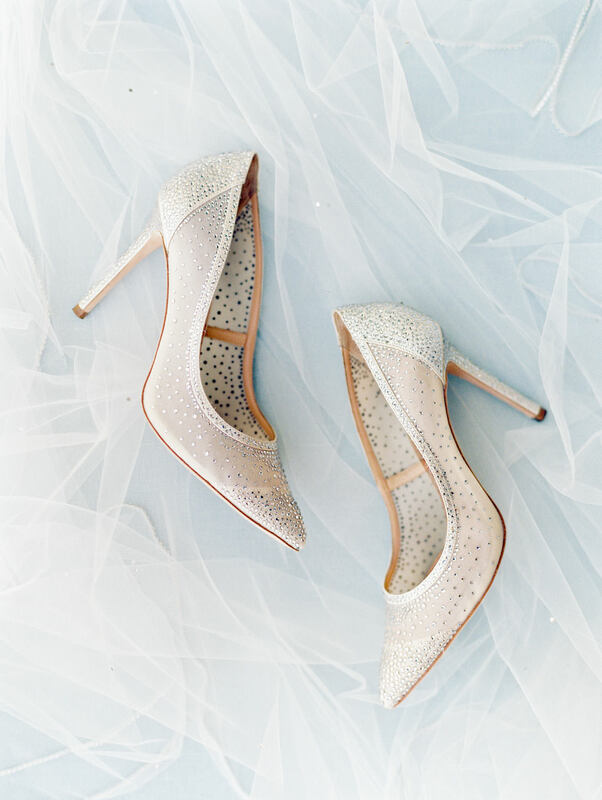 The couple had their first dance on a white floor in the middle of all of their guests. 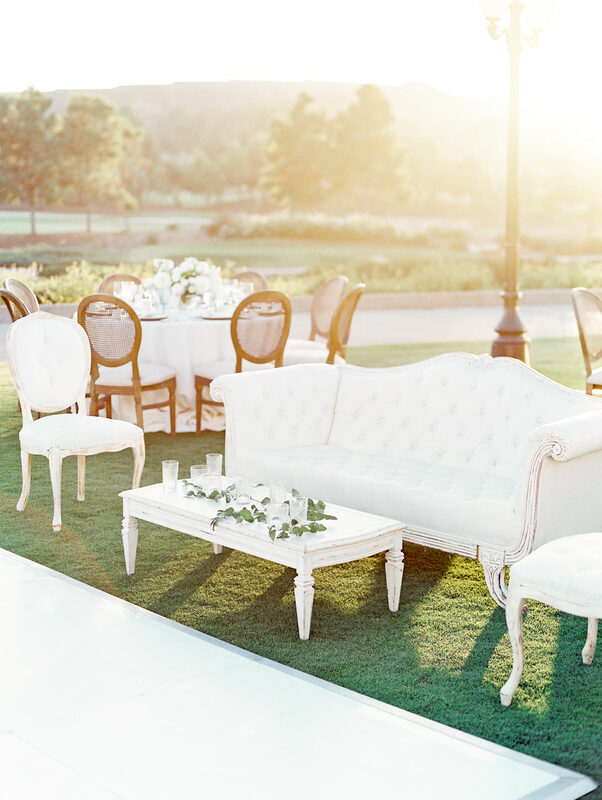 The sun was setting and it made for the most romantic lighting. 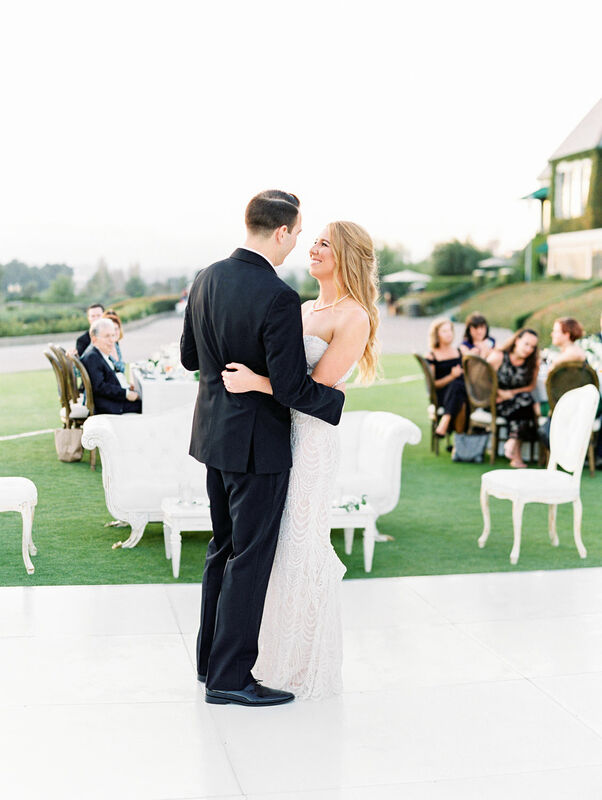 Taylor and Ian, you two are the best! 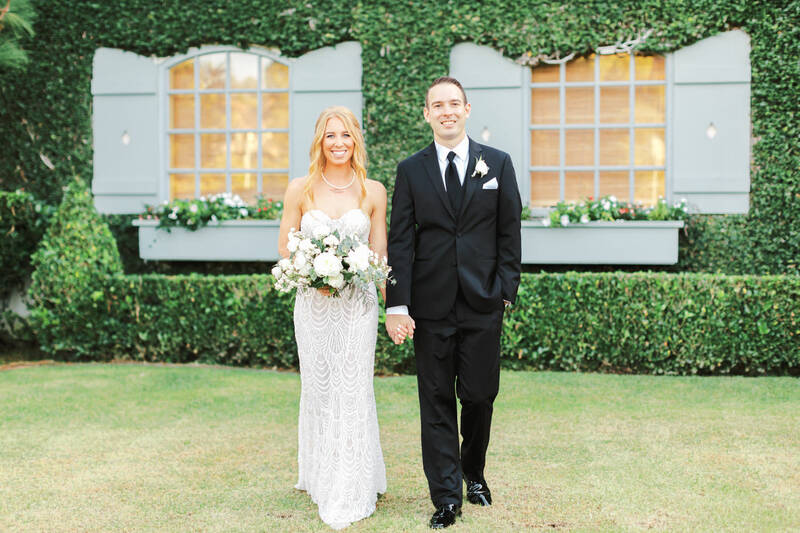 I loved shooting your Del Mar Country Club wedding and working with you both over the last year. 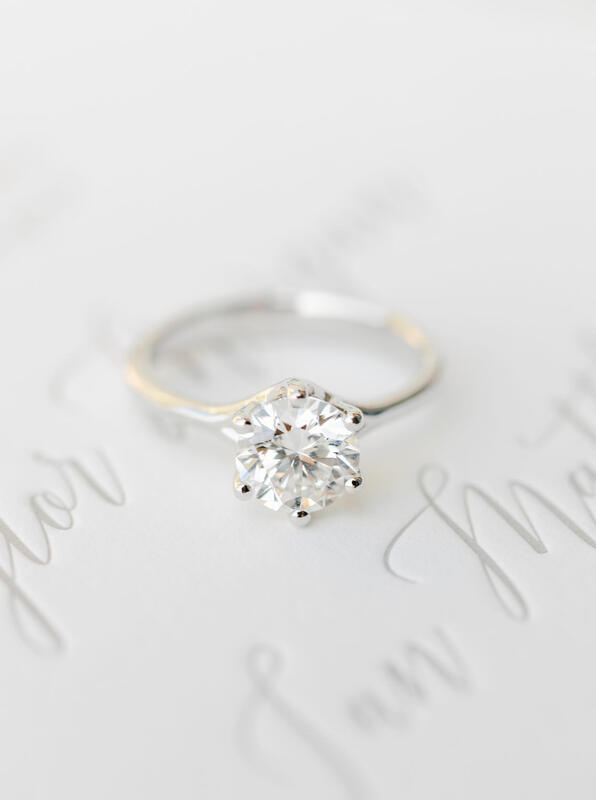 You’re so kind, sweet, and generous and so are your families. 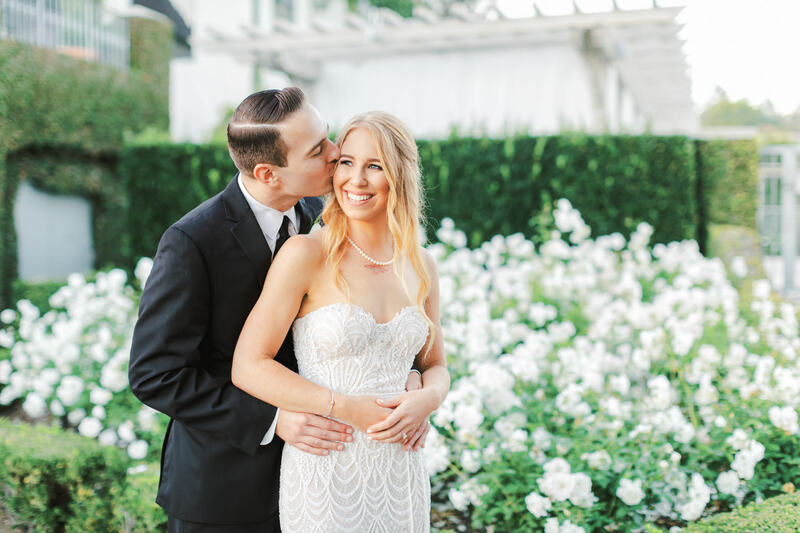 Thank you for being such gems to have as one of my couples!